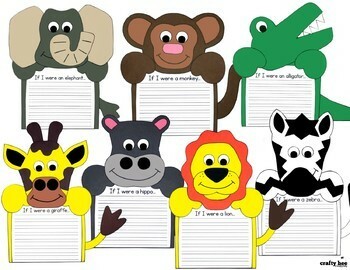 Writing prompts are great....but they are definitely more fun for your students when a craft is added to the activity. 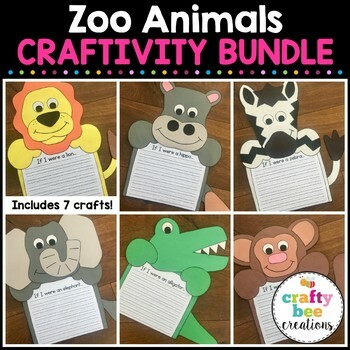 This set is perfect for learning about zoo animals and includes 7 projects: Giraffe, Lion, Hippo, Alligator, Zebra, Monkey, & Elephant. Purchased separately, these projects would total $26.25. Priced for $18.00 in this bundle, you save $8.25. That's a sweet deal! Please note: I have been creating projects and templates for Xeroxing for years. All my projects are created by me and templates are hand traced with spacing in mind. I try to fit as many pieces as I can onto a piece of construction paper while still giving children space to hold the paper and turn it for cutting. I do my best to make clean cut traced lines, but I am not perfect. My hand drawn templates have been used by many ages who have easily traced them and created replicas of my sample. Also, the colors I have selected for this project are just a suggestion, feel free to change them! 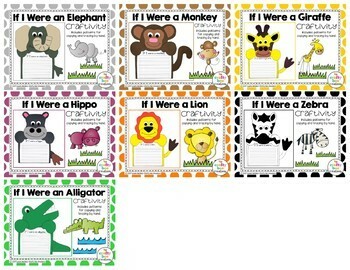 Themed Cut and Paste Sets.